In the first installment of The Ring, By The Numbers, we looked at the amount of time, effort, and staff support that goes into the rehearsal process. Now, let’s put some more figures behind the world that you will see onstage and see the elements that make The Ring cycle so monumental. It takes a heightened level of endurance from the singers and staff (not to mention the audience members) to present 17 hours of music. It certainly brings a convincing argument to the “opera is long” stereotype! The musicians make The Ring stellar. Not only do the singers portray gods and giants, they do it in a way to humanize these mythical characters and make them relatable. The orchestra players also have to rise to the challenge of playing some of the most colorful and dramatic music written for the stage. 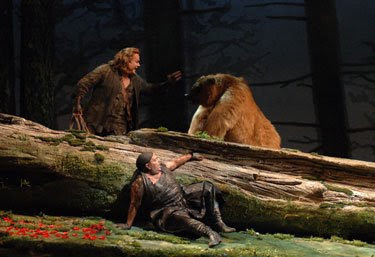 These odds and ends are the bits that transport the audience into the world of The Ring – from coveting Freia’s magic apples, to witnessing Brünnhilde on her lonely ledge, to bounding through the forest with Siegfried and his companion. All and all, the numbers add up to be one incredible experience for everyone involved. Hope to see you there! Animals: "Ring" two; one real and one a persson in costume". But how about the third (the Forest Bird in "Siegfried", act II)?? What was it?? Certainly not an aviary canary -- nor a soprano in Papagena's costume, but what?? Look closely in one of the trees just before the soprano sings from offstage.